At the Hello Blogger Events blogger meet up last weekend, we talked very seriously about the subject of toilet paper folding or scrunching. I truly don't understand how people have time to fold, or how it could ever be as effective as a full hand scrunch! I found that on discussion of this with my girlfriends, people have some very strong views as to which side they are on! 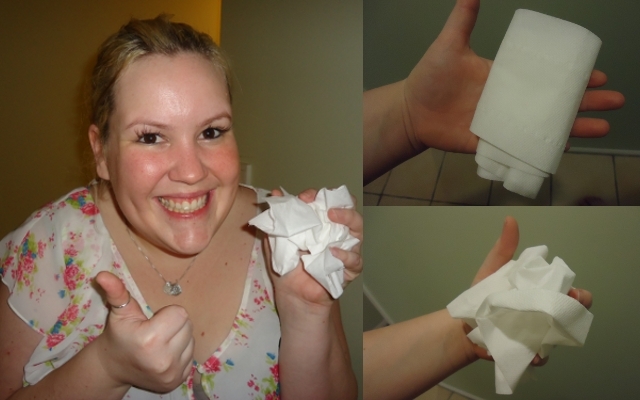 Lisa from Renovating Italy said that her Nanna, Ivy, used to always use 9 sheets of toilet paper; and that this was the only way to wipe. This got my thinking, especially as we have just had to get the plumbers in to unblock our toilet. Their diagnosis of our plumbing issues: I use too much toilet paper! So here is the test, I pulled the roll down to where I normally pull too- and I use 5 sheets per wipe. Sounds pretty tame to me considering Ivy's dedication to the 9 sheet processes! Same amount of paper used for the scrunch and the fold picture. Pretty sure the job is done better with an epic scrunch. I am scrunch forever! Look at the haphazard creases prepared for anything and the wide surface area for better coverage- clearly it's the far superior option. So what is your verdict and why do you do it that way? Are you a sophisticated folder or a pragmatic scruncher (clearly I'm scrunch biased!)?? this post. is frickin. hilarious. i think i kinda scrunch and fold, to be honest. it's like i fold it up first then scrunch it up. haha. I keep forgetting about the 9 sheets! Augh, you'd think a pregnant lady that pees a million times a day would have tried it by no hey? lol is an understatement. You look like Stimpy form Rin and Stimpy in your postures and poses. I love the choice of white delicate calico for this uber gritty postage. Hey, I'm following you. I hope you are following. Please follow my blog because you are too cool. I'm a scruncher from way back....and I like to think I'm raising the next generation of scrunchers....now if only I could get them to FLUSH! hahaha, Love this post. Now it got me to think! Hilarious!!! Im more of a wrap the tissue around the hand a hundred times type of girl but if I had to choose, it would be to scrunch! Great post hun, very funny! Love your top! Lolz!! This is such a weird post Olivia!! Haha! You know I'm folder all the way baby!